House Greyjoy has long reigned over the harsh Iron Islands and the ironborn marauders who call the isles home. For centuries, the ironborn followed the Old Way, sailing out to reave and plunder the other kingdoms of Westeros. Although the Greyjoys bent the knee and joined the Seven Kingdoms, there are many who still desire a return to the Old Way—a day when the ironborn would be the terror of the seas once again. 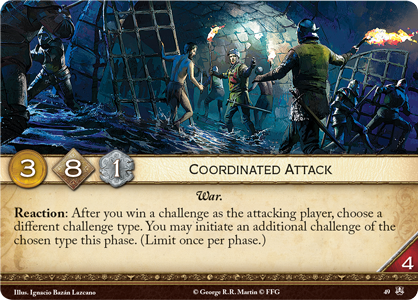 Now, as the Great Houses muster their armies and summon spies to struggle in the shadows, you have a chance to lead the ironborn as they return to the Old Way and pillage Westeros! 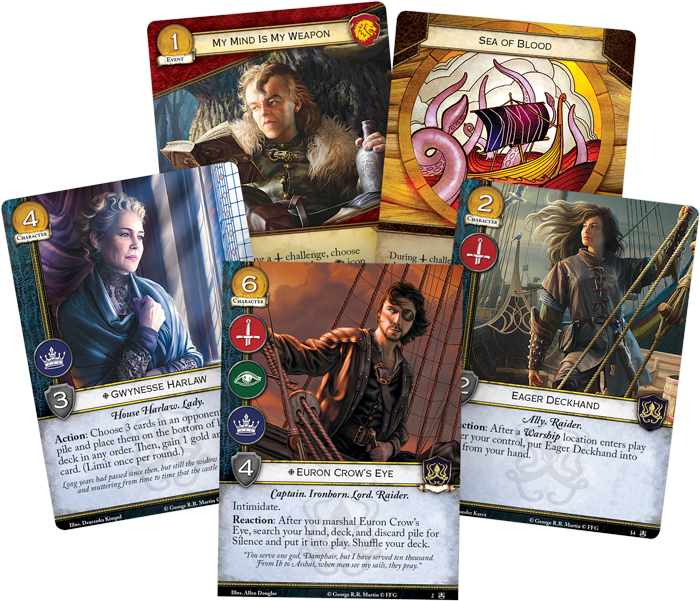 Today, we're pleased to offer a closer look at the most vicious cards you will find in the Kings of the Isles deluxe expansion for A Game of Thrones: The Card Game—now available for pre-order at your local retailer or online through our website! In ironborn culture, sailors speak of the iron price, the practice of earning your possessions by defeating adversaries and claiming their wealth for your own. On the Iron Islands, people are only entitled to what they can take and keep by force, whether it be material possessions, thralls, or salt wives. 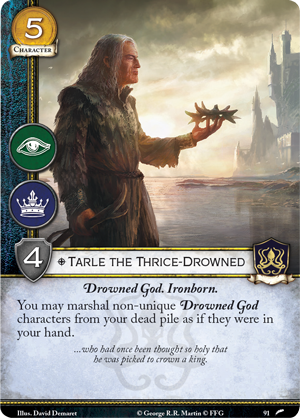 In Kings of the Isles, you will find three copies each of fifty-two new cards to help you take command of the ironborn’s devastating armada that have earned the Iron Islands infamy and renown across Westeros. 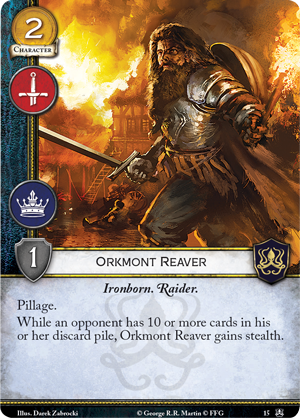 The Raiders of House Greyjoy specialize in hitting your enemies in their homes, burning and pillaging and forcing your opponent to discard cards from the top of their deck. 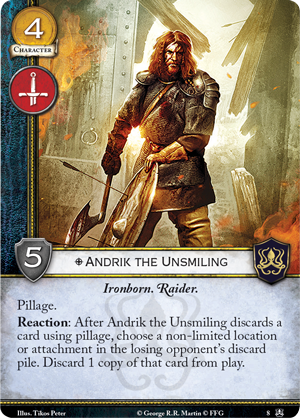 Andrik the Unsmiling (Kings of the Isles, 8) is among the fiercest of the ironborn’s reavers, remembering his foe’s weakness and using this knoweldge to gain the advantage should he ever encounter them again. With this fearsome Raider, whenever Andrik discards a card using pillage, you can choose a non-limited location or attachment in your opponent’s discard pile and discard a copy of it from play. But if learning and lying in wait is not your style as an impulsive reaver, you will find plenty of aggressive characters who thrive on acting quickly and attacking first, regardless of what sits in your opponent’s discard pile. When your enemy has too much to defend, it is a simple matter for the Orkmont Reaver (Kings of the Isles, 15) to pillage, taking all he wants and leaving only ash. 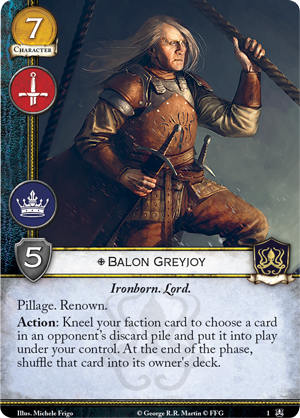 And as you fill your opponent's discard pile with cards, you make Balon Greyjoy (Kings of the Isles, 1) even more powerful. 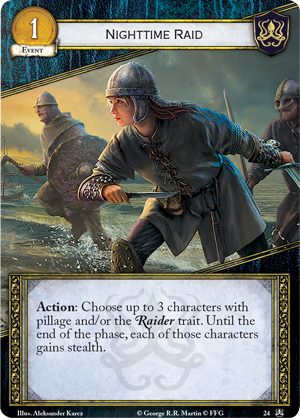 While many of your characters with pillage can work together across the battlefield, Kings of the Isles brings this to a new level with cards like Nighttime Raid (Kings of the Isles, 24). This event allows you to equip three of your Raiders or pillaging characters with stealth until the end of the phase. 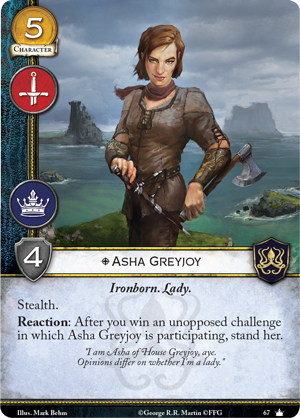 If you can use a Nighttime Raid during a turn where you launch a Coordinated Attack (Kings of the Isles, 49), you have the chance to launch even more attacks, reusing key characters like Asha Greyjoy (Core Set, 67) to shred your opponent’s plans with precision. 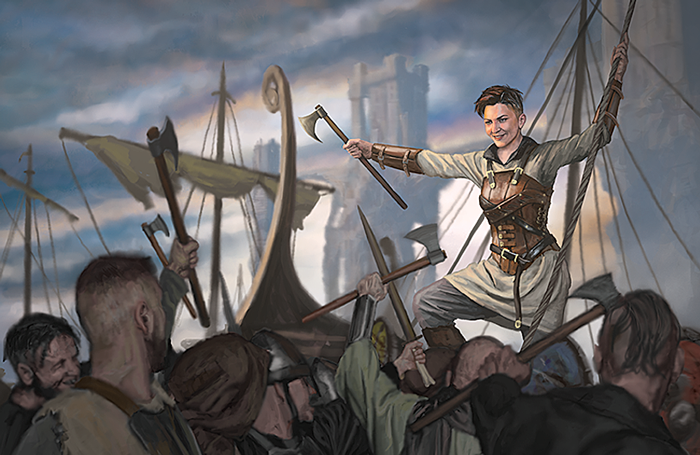 While Kings of the Isles focuses on House Greyjoy, this expansion includes new cards from every faction, as well as a variety of neutral cards that any leader can use to strengthen their army. 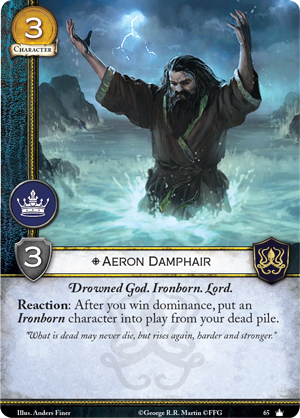 But the influence of House Greyjoy can be felt throughout Westeros, and in this expansion you will find many cards that take lessons from the ironborn while still remaining true to the spirit of their own Houses. For example, the cunning and vengeful House Martell is a fitting pupil for the ironborn’s particular brand of warfare. 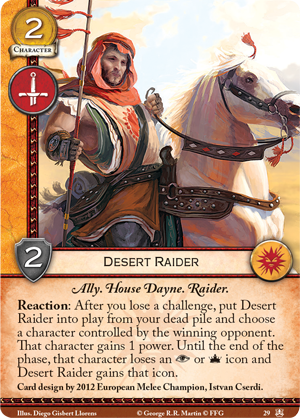 The Desert Raider (Kings of the Isles, 29) can return from the dead like the followers of the Drowned God, while still playing into his House’s key ability to manipulate icons. Even the rigidly honorable Stannis Baratheon must take notes from the ironborn if he wishes to secure his claim to his brother’s throne. 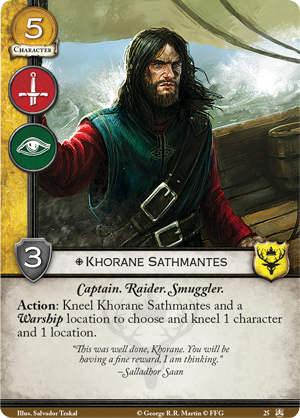 In Kings of the Isles, he brings the smuggler Khorane Sathmantes (Kings of the Isles, 25) into his ranks. Sathmantes also bears the Raider trait and has a close relationships to Warships, but unlike many Greyjoys, he prefers to control his enemies without killing them. With these new powerful options, any player can include Raiders in their deck, attacking your enemies in their own territory to not only defeat but completely demoralize them. 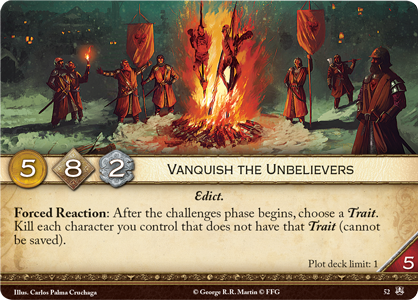 If you choose to fully embrace the ruthless and merciless nature of the Ironborn, you may even employ a new plot Vanquish the Unbelievers (Kings of the Isles, 7). This plot has good gold, initiative, and claim, but you must kill each of your characters who does not have the trait that you choose. For House Greyjoy, this could prove particularly useful, whether you're loyal to the Drowned God, or you simply fight for all Ironborn. After all, What Is Dead May Never Die (Kings of the Isles, 52). 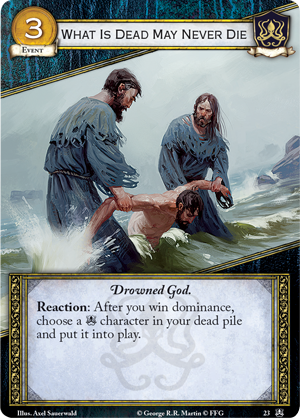 By trusting in the power of the Drowned God and his devoted followers like Aeron Damphair (Core Set, 65) or Tarle the Thrice Drowned (The Faith Militant, 91), you can turn any deaths to your advantage and bring your warriors back to fight for you once more. When they rise again, they will return harder and stronger. Take control of the Iron Fleet and try your hand at leading the raiders of House Greyjoy to a new age of glory. But be cautious—the world of Westeros is unforgiving of failure, and in no place is this truer than the Iron Islands. If you fail in your endeavors, your enemies will be the least of your problems. 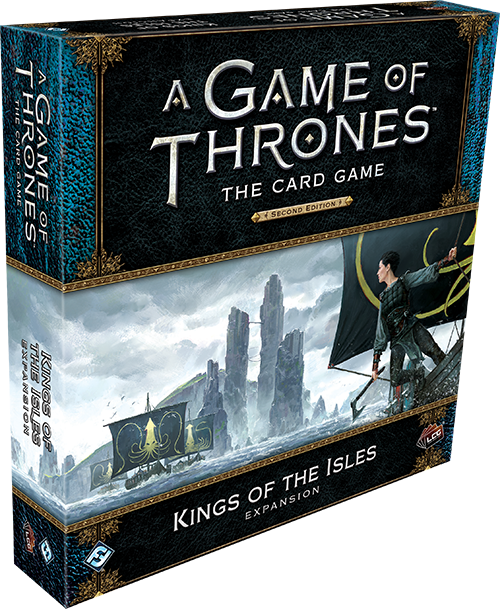 Pre-order your copy of Kings of the Isles (GT45) at your local retailer today or on the Fantasy Flight Games website here!